Birthplace : Santa Monica, California, U.S.
Sean Justin Penn is an American actor, screenwriter and film director, also known for his political and social activism. He is a two-time Academy Award winner for his roles in Mystic River (2003) and Milk (2008), as well as the recipient of a Golden Globe Award for the former and a Screen Actors Guild Award for the latter. Born Sean Justin Penn on August 17, 1960, in Burbank, California. His father, Leo Penn, was an actor and director. His mother, Eileen Ryan, was an actress. Sean grew up in Los Angeles, and attended Santa Monica High School along with fellow students and future actors Emilio Estevez, Charlie Sheen, and Rob Lowe. An early interest in filmmaking, specifically directing, led to Penn's passion for acting. He moved to New York City at the age of 19 to pursue a career as an actor. He soon landed a part in a Broadway play, Heartland. In 1981, he made his film debut alongside budding star Tom Cruise and Oscar-winner Timothy Hutton in the military school drama Taps. Penn's breakthrough role came a year later, when he played the perpetually stoned surfer Jeff Spicoli in the high school comedy Fast Times at Ridgemont High (1982). He garnered acclaim for his first starring role in 1983's Bad Boys, and for the drama The Falcon and the Snowman (1985). In 1985, Penn gained a whole new measure of fame when he married pop icon Madonna. Their tumultuous four-year marriage produced one dismal movie, 1986's Shanghai Surprise, and a barrage of tabloid headlines. Penn's bad boy image only increased with his continued hostility toward the aggressive paparazzi he served 34 days in prison in 1987 for punching an extra who tried to take his picture. Penn and Madonna divorced in 1989. In 1991, two years after earning rave reviews for his performance in Casualties of War (1989), Penn directed his first film. The feature The Indian Runner opened to a limited release in theaters, and made a meager $34,047 at the box office. Critics gave the film mild praise. Though he previously claimed he quit acting, Penn returned to the front of the camera in 1993, playing a coke-addled criminal lawyer in De Palma's Carlito's Way, co-starring Al Pacino. His performance earned him a Golden Globe nomination for Best Supporting Actor. In 1995, he starred as a death row inmate searching for salvation in the film Dead Man Walking, based on the true story by Helen Prejean. The film earned Penn Academy Award and Golden Globe nominations, as well as an Independent Spirit Award. The film also did well with audiences, grossing more than $80 million worldwide. That same year, he wrote, produced, and directed The Crossing Guard, a dark drama starring his boyhood idol, Jack Nicholson. The film received positive reviews from critics, as well as a Golden Globe nomination. Penn next starred as a lovesick, jealous husband in Nick Cassavetes's She's So Lovely (1997), co-starring John Travolta and Penn's real-life wife, Robin Wright Penn. Although Penn (who also served as executive producer) won the Best Actor Award at the Cannes Film Festival, She's So Lovely did not attract a wide audience. Penn appeared in two other major films in 1997: the poorly received U-Turn, directed by Oliver Stone, and the hit action-thriller The Game, starring Michael Douglas. In Hurlyburly (1998), Penn reprised a role he played on the Los Angeles stage in 1988. That same year, he also starred in the critically acclaimed World War II drama, The Thin Red Line, directed by Terrence Malick. In 1999, the unpredictable Penn took Hollywood by surprise when he garnered a second Academy Award nomination for Best Actor, turning in another searing, darkly complex performance as the dissolute jazz guitarist at the center of Woody Allens Sweet and Lowdown. In 2000, he starred in the romantic Up in the Villa with Kristen Scott Thomas, and The Weight of Water. His third directorial feature, the thriller The Pledge, starred Nicholson and Robin Wright Penn. In 2002, Penn starred opposite Michelle Pfeiffer in I Am Sam, playing a mentally disabled man who fights to regain custody of his young daughter. The following year, he starred in Clint Eastwood's small town drama Mystic River, for which he earned an Academy Award for Best Actor. In 2006, Penn starred as Willie Stark, a fictional character based loosely on Louisiana governor Huey Long, in All the King's Men. Penn won his second Academy Award for best actor for his portrayal of the first openly gay politician, Harvey Milk, in the film Milk (2008). The film received more than 40 award nominations, and has performed well at the box office. Other current projects for Penn include the action film Tree of Life which is slated for release in 2009, and a remake of the comedy classic, The Three Stooges. 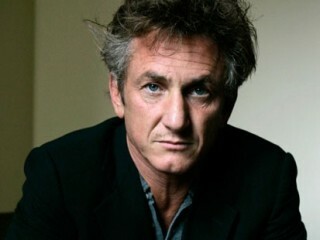 View the full website biography of Sean Penn.